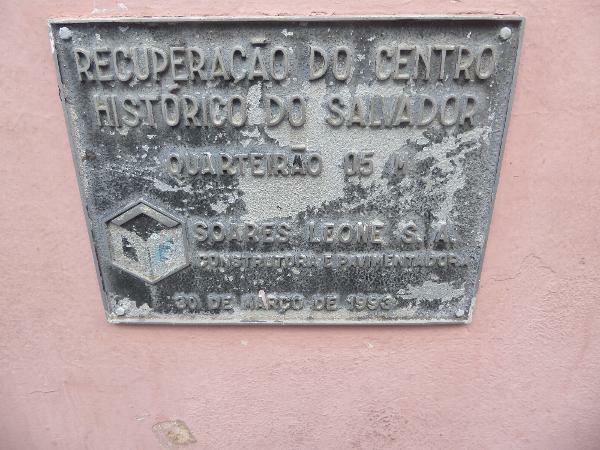 You can argue about it, but the founding of Salvador should probably be pegged at 1549, when Tomé de Souza arrived as governor-general of Brazil. His task: set up a system of direct rule to replace the "captaincies" or hereditary estates that the Portuguese Crown had earlier tried and found insufficiently lucrative. The Jesuits arrived in 1549, too; the laggard Benedictines and Franciscans stayed away for roughly another 40 years. Things moved slowly: it took over a century for the Jesuits to complete a cathedral, thoughtfully demolished in the 1930s. 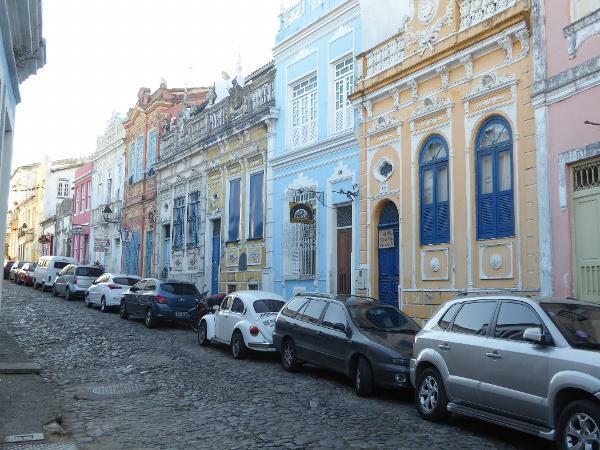 Early Salvador was apparently a dangerous place: a visitor named Ramponi reported that every morning a couple of dozen corpses were found on the city's streets. 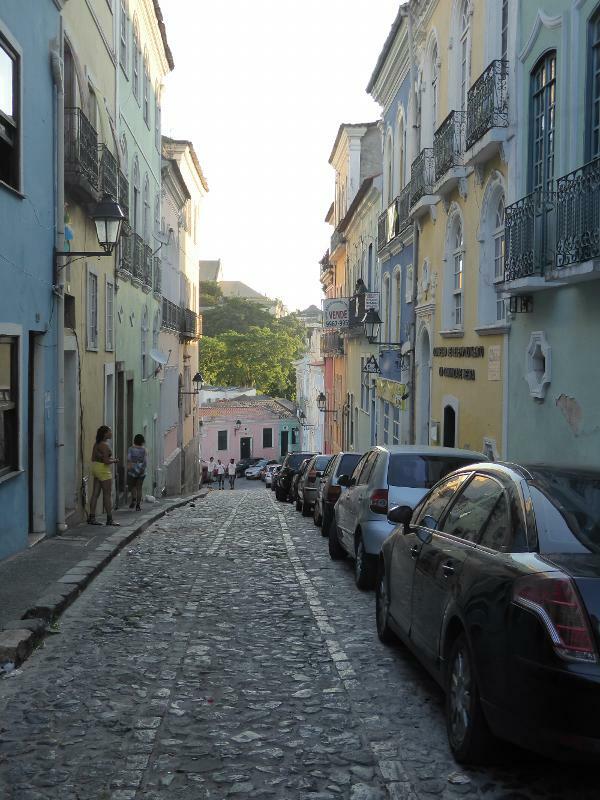 The century straddling 1700 was a good one for Salvador, however--even a great one. 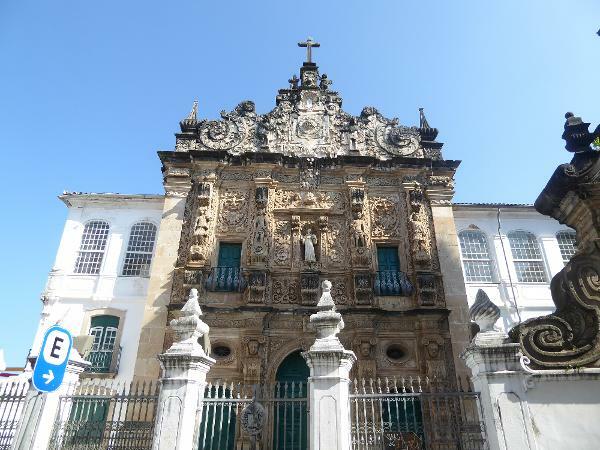 With perhaps 100,000 people, the city replaced Goa as the biggest city of Portugal's overseas empire. 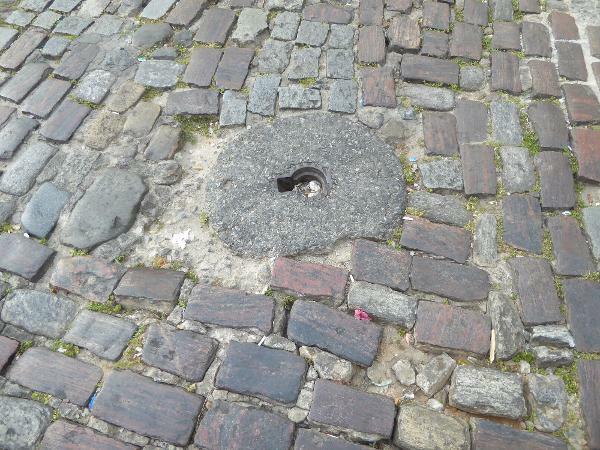 In 1763, the hammer fell, however: the capital was moved to Rio, as devastating a blow as a similar and later switch would prove in Calcutta. Both cities recovered slowly and today are bigger and richer than ever, but the long, long slump is still evident at a hundred places in both cities. 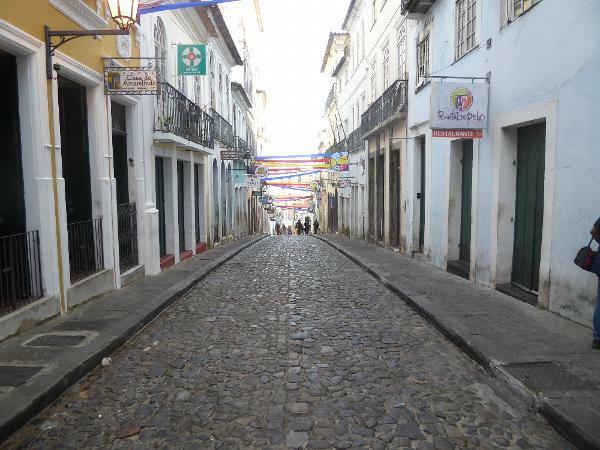 That's the Ladeira do Carmo ("Slope of the Carmelites") on the left and the Rua das Flores on the right. (Yes, there's a Carmelite convent up top, though it's been converted to a hotel. Over on the right, you'll be disappointed if you go hunting for flowers.) We've just come in from the airport and are heading to a B&B up the hill. 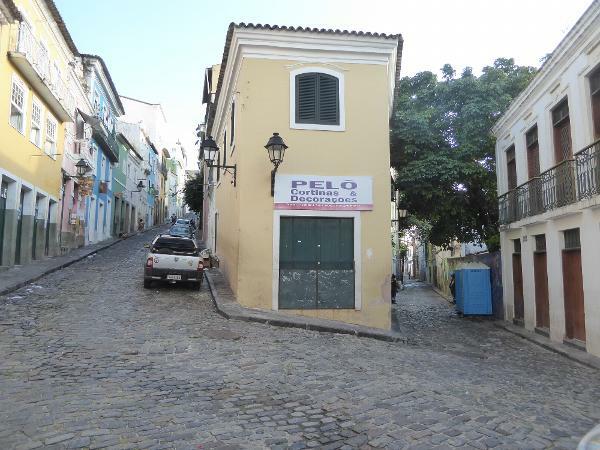 The famed pelourinho district is just behind us, but we're too disoriented to know that. It's been 30 years since we were here, and the synapses aren't what they used to be. Same slope, but looking back down. 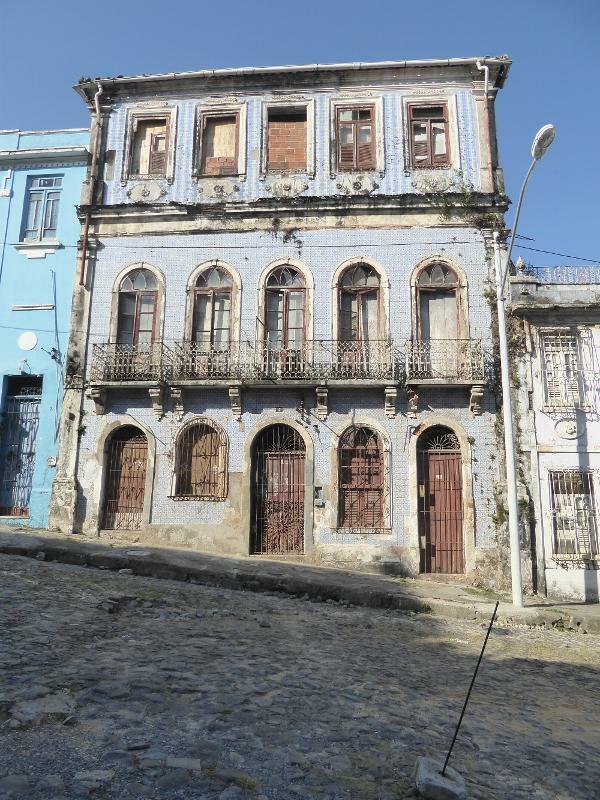 A lot of money has gone into restoring these buildings: that's what happens when UNESCO puts you on its World Heritage list. (Salvador made the list in 1985.) Despite what you probably think, the paving is smooth enough that you won't trip. Stone settles pretty well after three or four centuries. 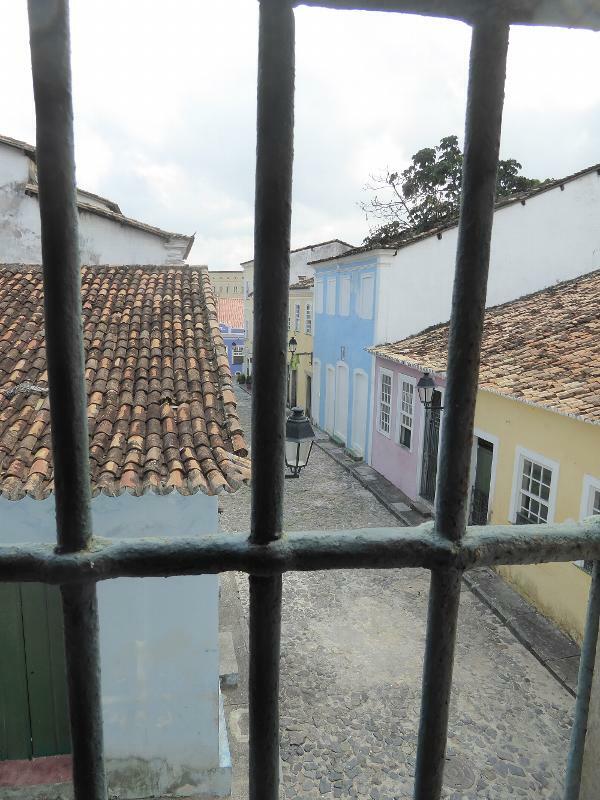 A scholarly note on the townhouses, or sobradas. 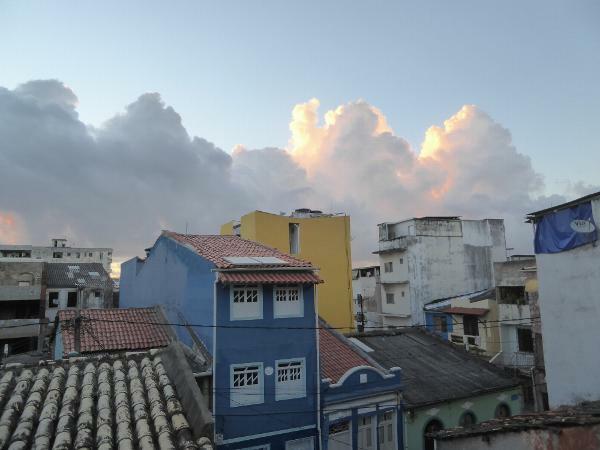 "Some town houses in Recife contained up to five floors, and the location of the kitchen [on the top floor] would have been inconvenient if not for the existence of slave labor." Let's hope the author intends sardonic humor. 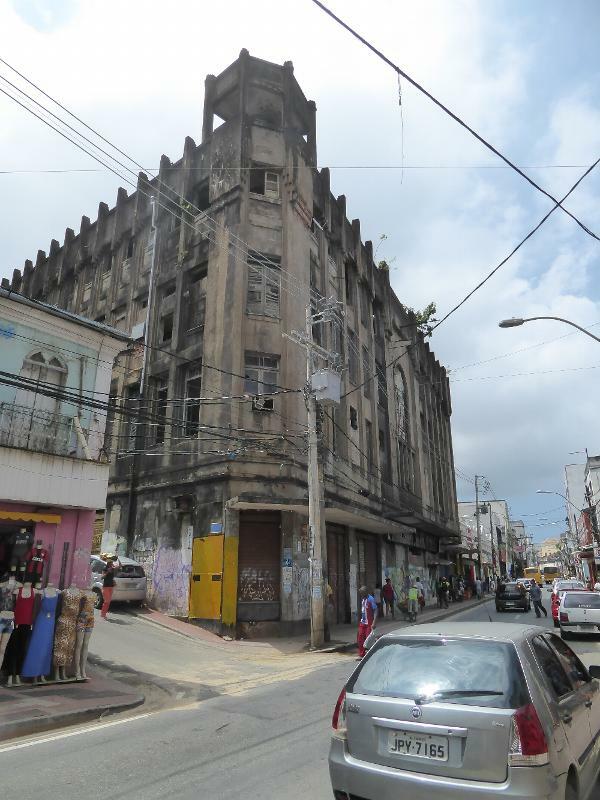 See Roberto Montezuma, Arquitetura brasil 500 anos, 2002, p. 126. Well, here we are, tucked in on the fringe of the historic center. A lot of new houses have been tucked in with us, and their builders haven't been the least bit worried about stylistic conformity. Still, it's a very busy place; too bad you can't hear the sounds of people living. 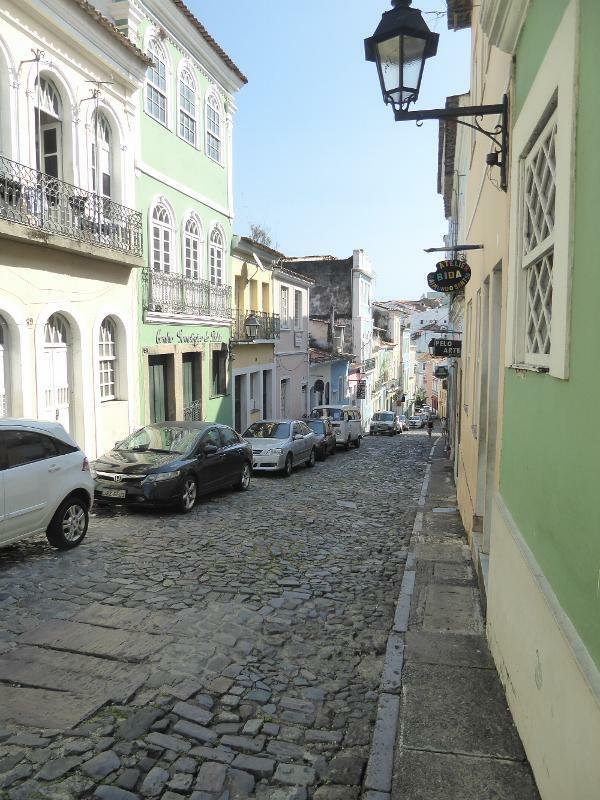 Can't stay cooped up, so we're out on Rua Direita ("Straight Street") with a very bookish guide. 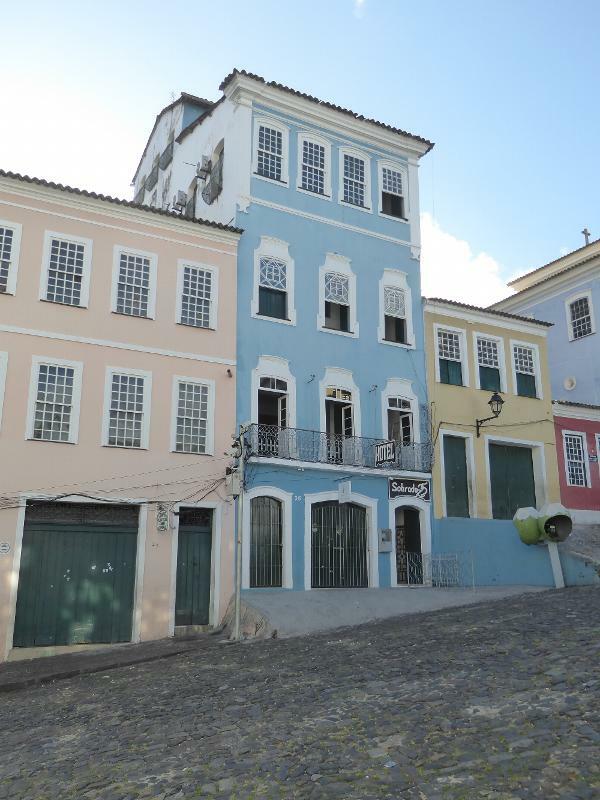 "The sobrado was a town house of two or more floors and was a typical urban building. 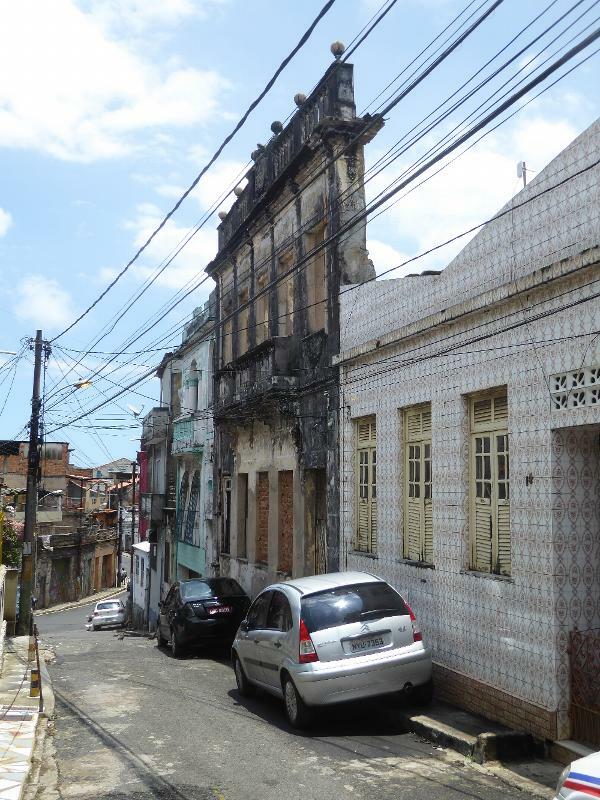 The houses were built in rows with adjoining walls, thus renouncing artistic individuality in order to blend with the architectural composition of the city. The continuous exteriors--flat or curved, horizontal or inclined--defined the architecture of the city as a backdrop to the layout of public spaces." I'm not sure I quite the last bit, but along this street there are no style-breakers. Everybody plays along, except when it comes to parking their cars. No help there: we're almost all bulls in that china shop. Funny, how asphalt suddenly looks cheesy. You soon learn to be glad that most of the town's churches are more or less permanently locked: if they weren't, there'd be no time left for anything else. 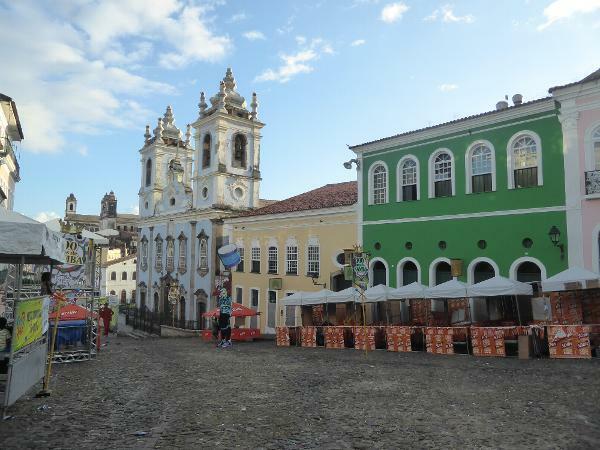 So we'll happily pass the Igreja do Santissimo Sacramento do Rua do Passo. Translation: the Church of the Blessed Sacrament of Step Street. 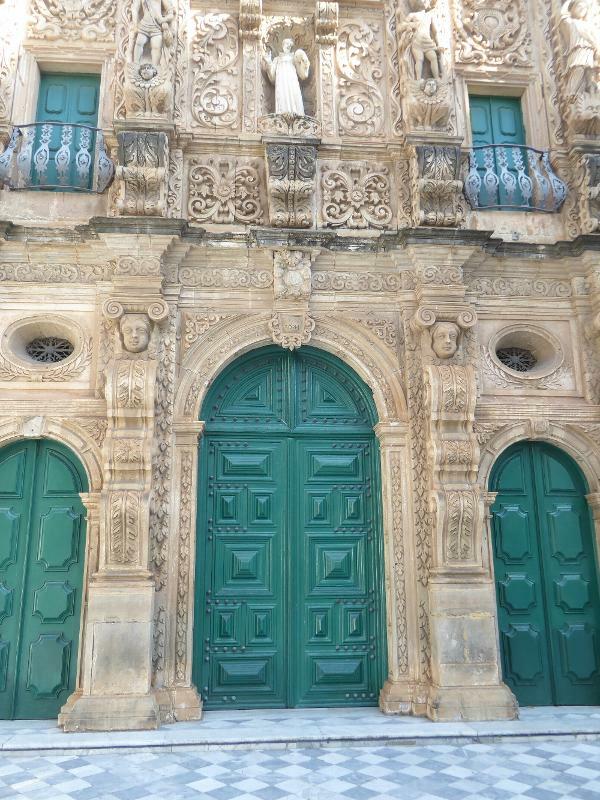 Opened in 1736, it's been closed for an extraordinary 20 years. 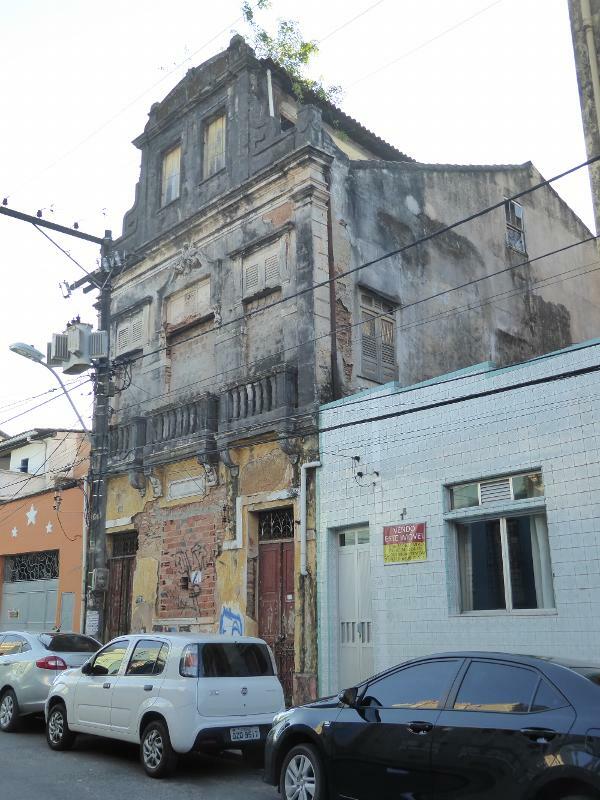 Like most of the churches around here, it was mostly paid for and used by a brotherhood or fraternity of laymen, an irmandade, in this case one renamed in 1872 as the Venerable Third Order of the Immaculate Conception of the Blessed Virgin of Boqueirao. The brotherhood was more decorously known in translation as the fraternity of "tawny-complexioned men." 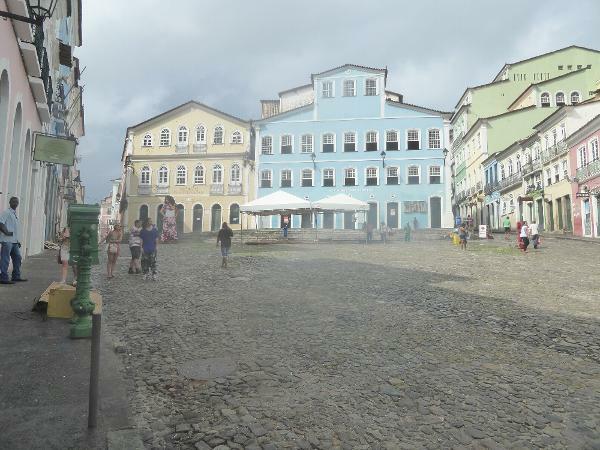 See Memoir of the State of Bahia, by Joaquim Lima, Director of the Public Archives, 1893. 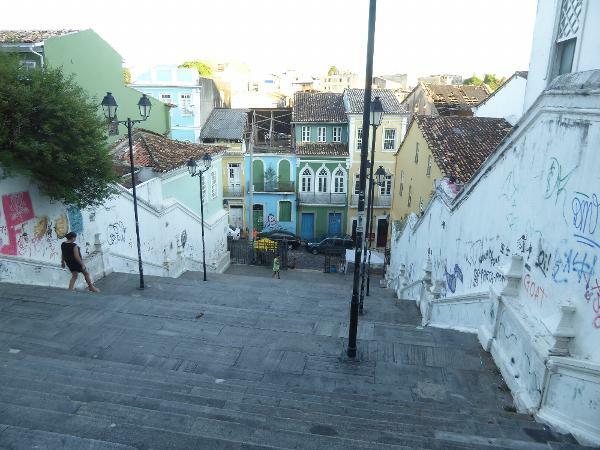 Here are the steps in question, directly across from the church and making entry an act of exhausting submission. Remember, this is the tropics. You don't want a sweater. 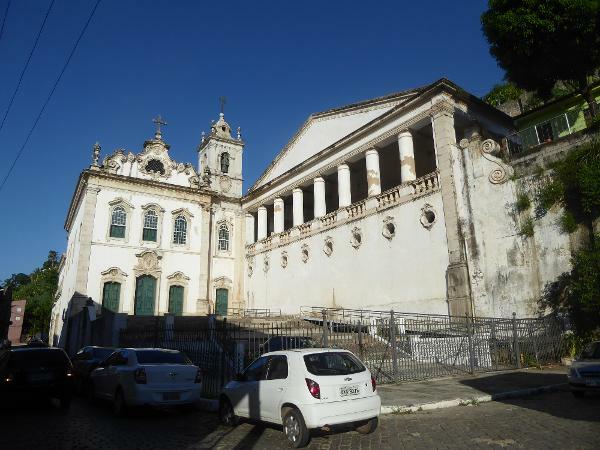 Almost next door, here's the church of the Third Order of the Carmelites, built during the city's boom years. The pilasters look like legs in a amusement-park mirror, but on the ground you probably won't notice: too much going on. 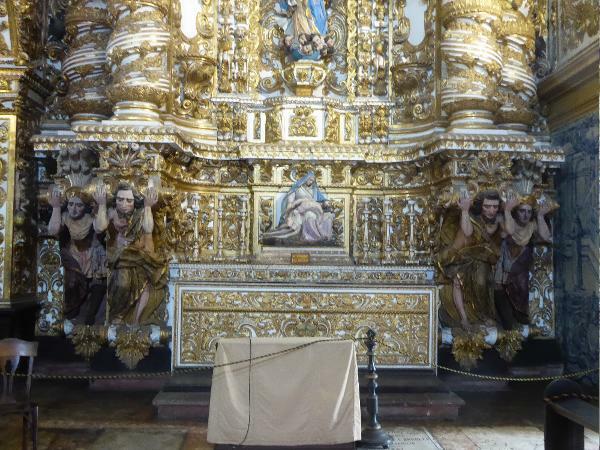 The church was closed when this picture was taken, but it opened the next day. Want to see inside? Wow, you say? 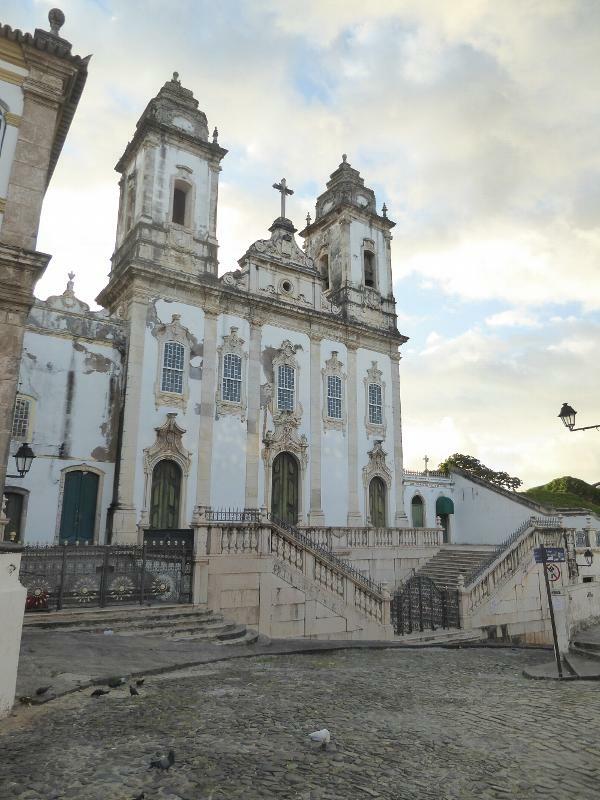 The blue's nice, but after you've seen the churches of inland Brazil you're more likely to notice the marble floor. 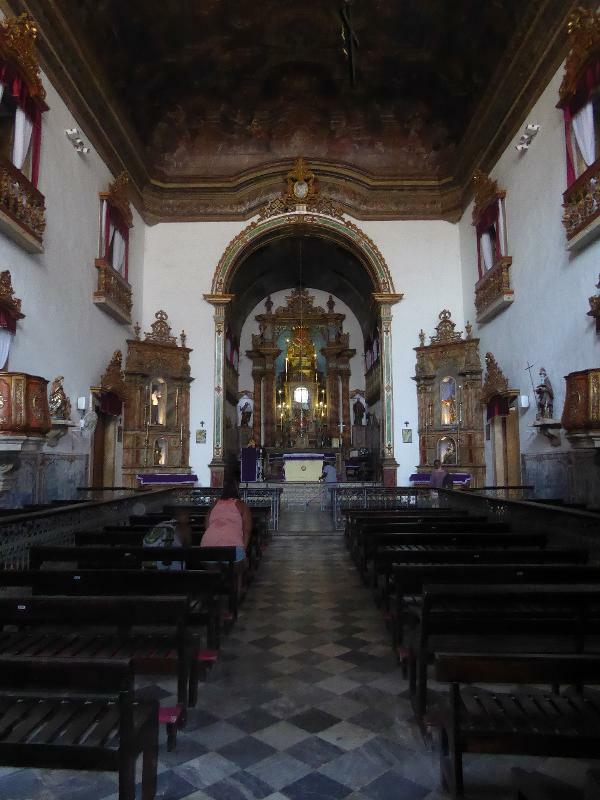 It's imported, and the point is that the grand churches of inland Brazil have no marble. Just too hard to get, so wood had to suffice. 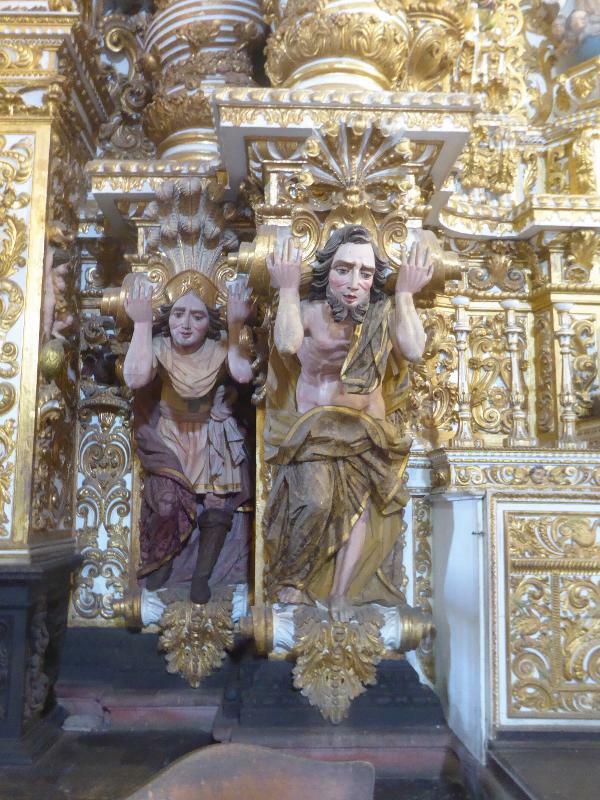 The baroque trim here is impressive until you get overwhelmed by the multifold exuberance in other nearby churches. Stay tuned. Altar sans flash. As Mick says, you can't always get what you want. 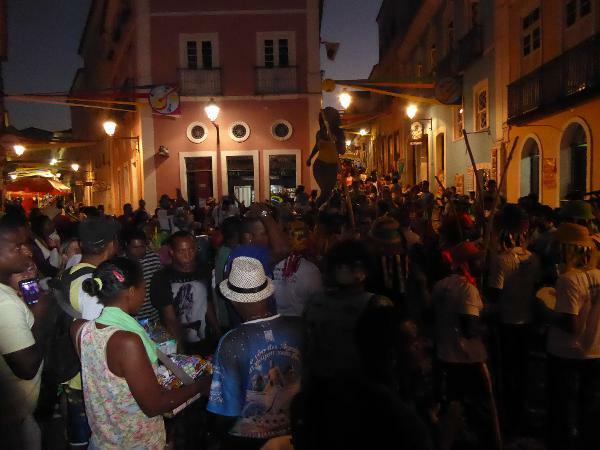 We're back on the street and looking toward the pelourinho. It's over there, just on the other side of the notch in the ridge top. The district takes its name from the pillory or whipping post euphemistically called the "place of justice." 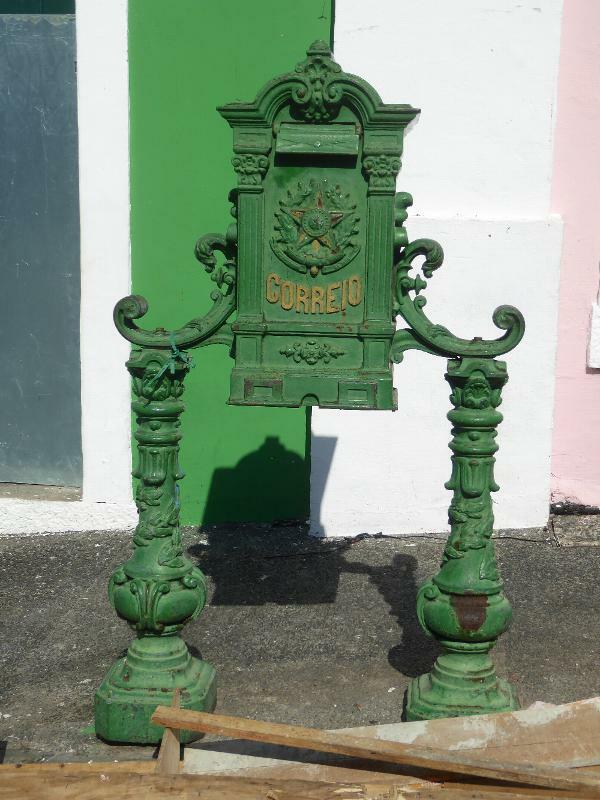 Two pillories survive in all of Brazil (they're in Obidos and Mariana); in Salvador only the name is left, along with the plaza or largo in which it stood. Question: do the parallel stones here indicate an old tram line? Sure looks like it. 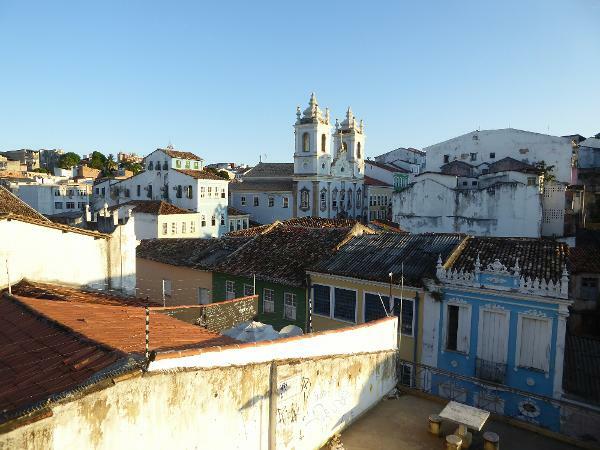 We're peeking over the topographic notch and toward the church of Nossa Senhora do Rasario do Pretos, or Our Lady of the Rosary of the Blacks. 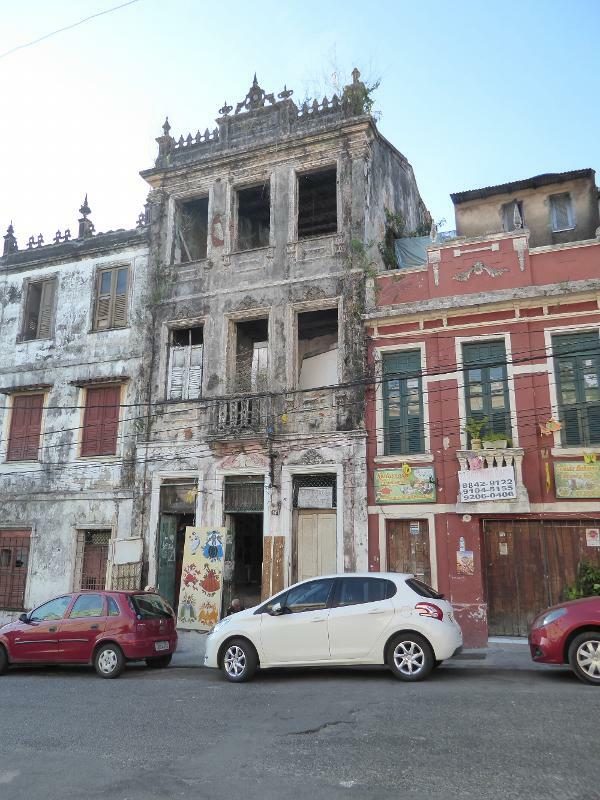 It fronts on the plaza that once held the pelourinho. 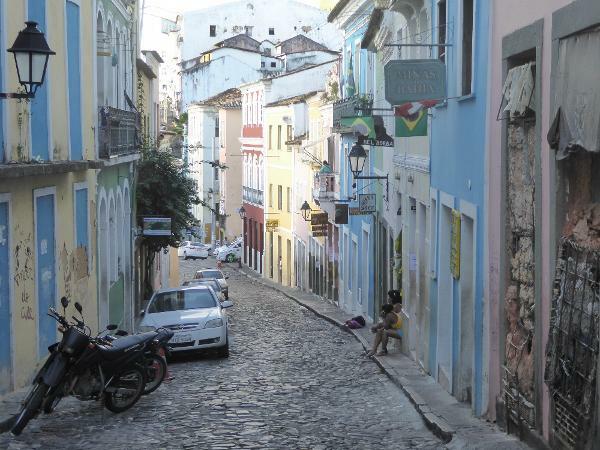 Here's the lower half of the Largo do Pelourinho, which slopes back toward the notch in the ridge. 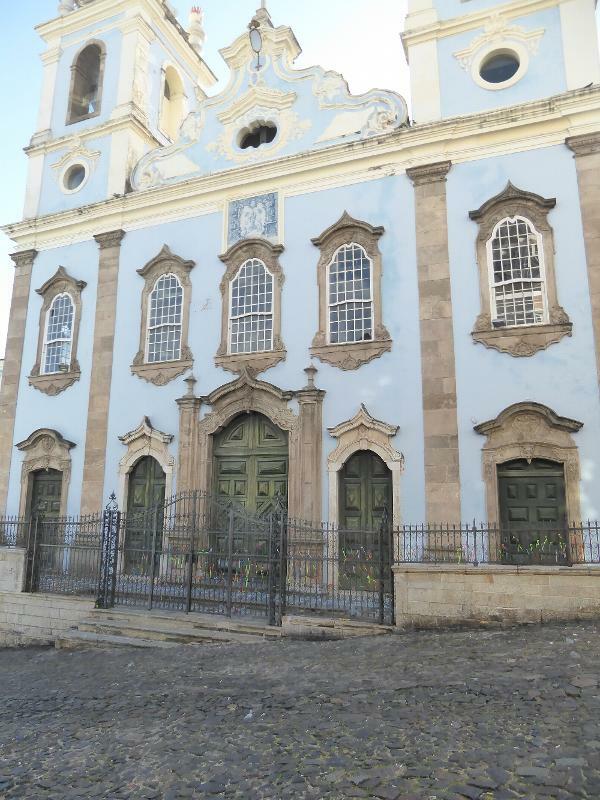 Brazil abolished slavery in 1888, so this church, begun in 1704 and more or less finished in 1780, was built by a brotherhood or mutual-aid society of slaves. 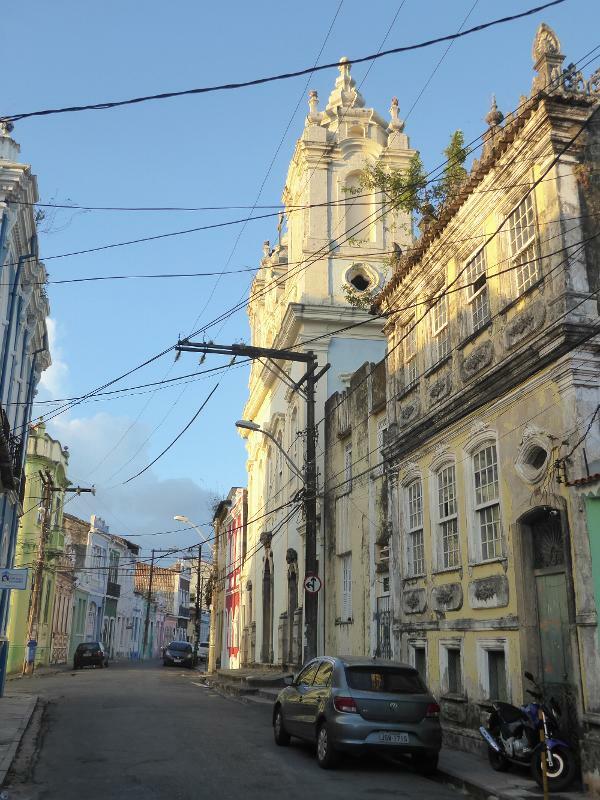 Every parish in Salvador had such a brotherhood; this one was established in 1685. Raises all kinds of questions, doesn't it? And here's the upper half. 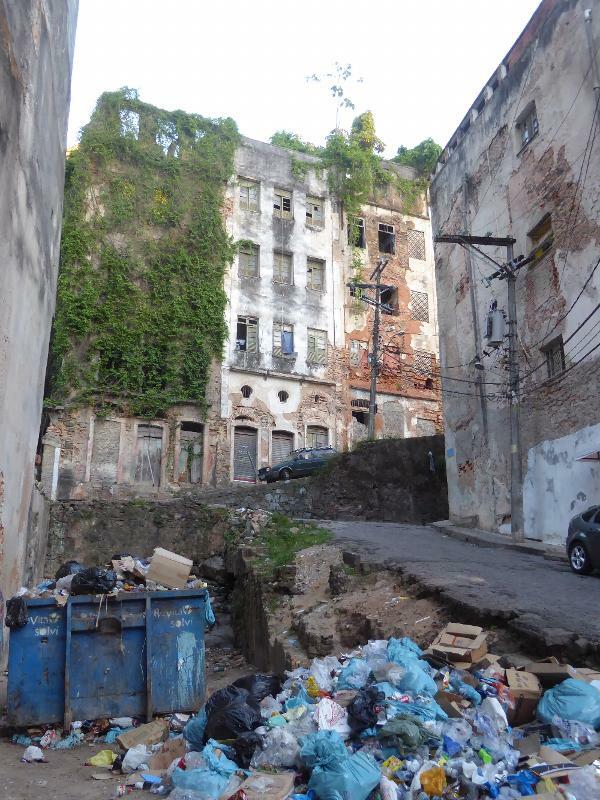 This was an elite residential neighborhood until about 1900. 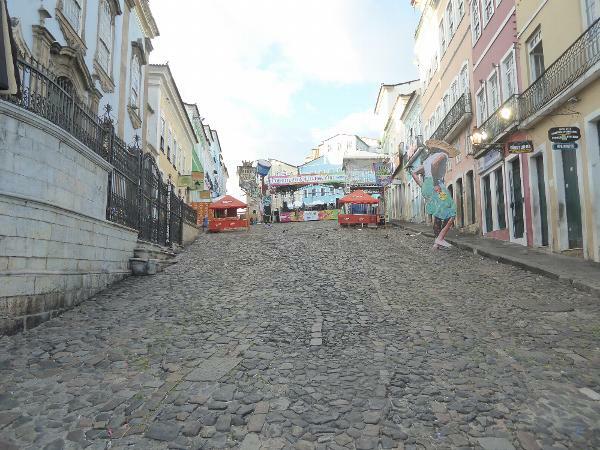 Then it fell into steep decline until its touristic revival after 1990. 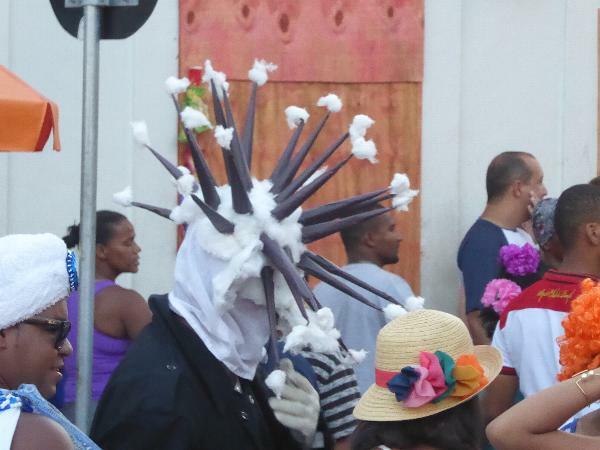 At the far end, a temporary stage has been set up for Carnival, 2016. 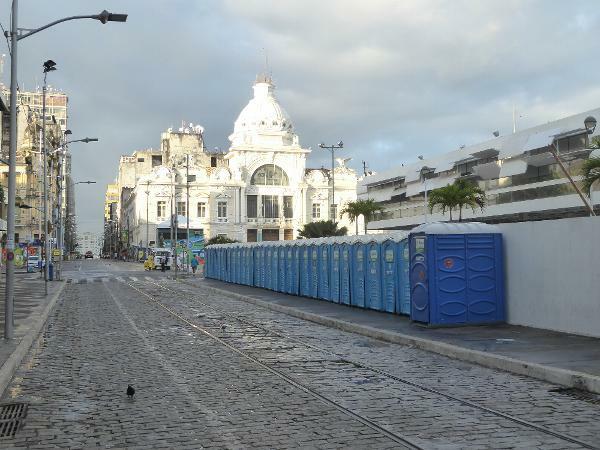 A couple of days later, the stage was gone, and the square was being cleaned up. That's a mailbox on the left. What do you think the appraisers would say if we dragged it into Antiques Roadshow? Another view of what has become an outdoor shopping mall. 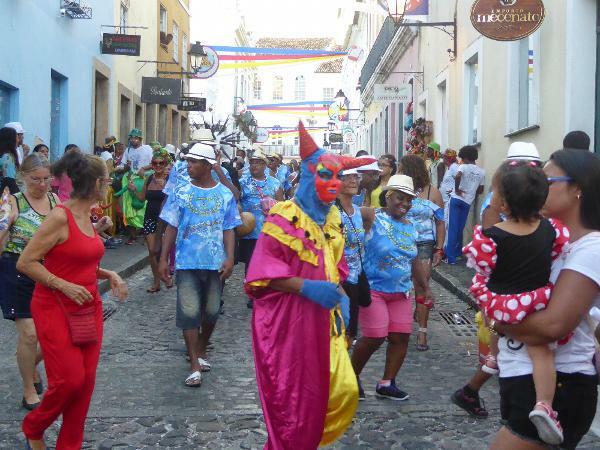 Most local merchants were hungover or at least still in bed when this picture was taken. We're back, nothing if not persistent. If there's any doubt about our philistinism, it should be resolved by our superfast entry and exit. So the kitchen was way up top, and slaves did the fetching. They did some grinding, too. I'm betting corn. We're going to push further into the district. A wall-mounted plaque recalls the restoration effort. 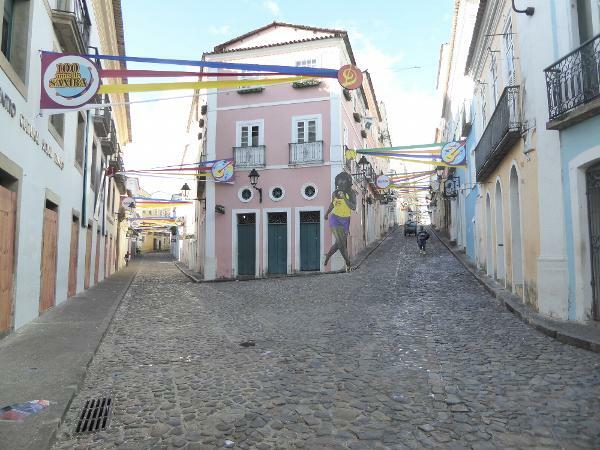 Unlike the Spanish, who laid out their American towns with gridiron regularity, the Portuguese were much more relaxed. The result is more fun, but it also makes it a lot easier to get disoriented. 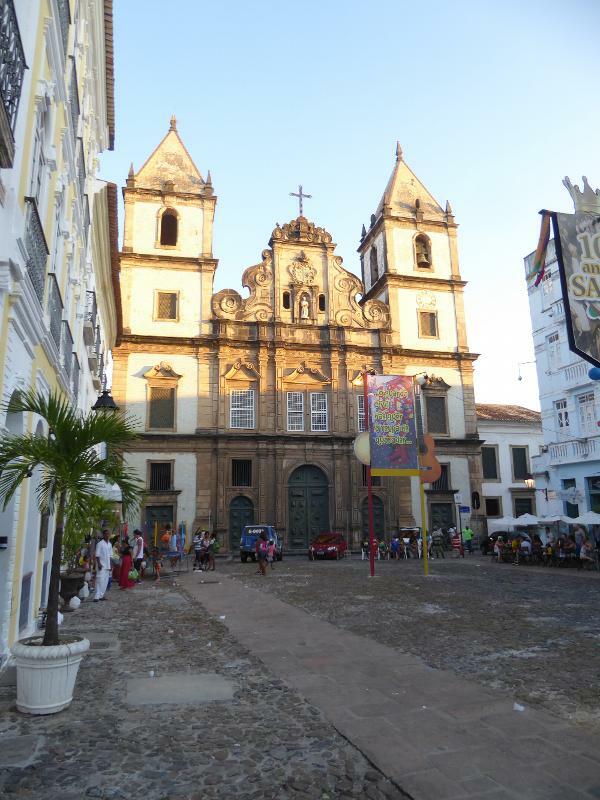 This is Salvador's cathedral, until 1933 simply a Jesuit church. It's almost instantly recognizable as a Jesuit church not only from the facade statues of the order's founders (you can see Ignatius of Loyola, Francis Xavier, and Francis Borgia) but because it's a close copy of the mother church of the Jesuits, the Gesu Church in Rome. The stone's European, too, schlepped all the way from Portugal. Alas (or maybe not, depending on how your feet are feeling) it was closed for repair in 2016. Don't like the paving? 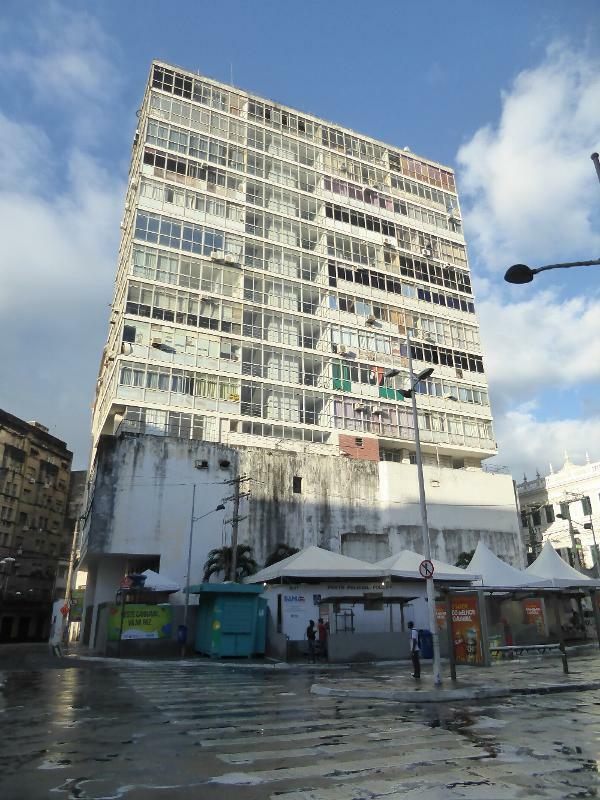 Check the undated photo on Planche 12 of Germain Bazin's L'Architecture Religieuse Baroque au Brésil, 1956. It shows the plaza as a garden with paths between trees and grass. The layout wouldn't have accommodated crowds, but back then there weren't any. 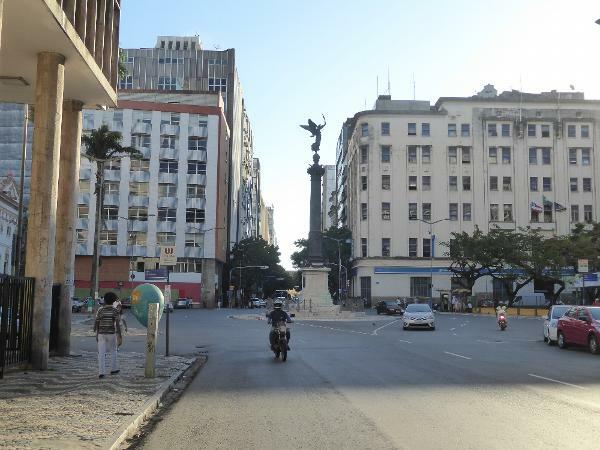 Here it is from a distance, seen through the length of the Largo do Cruzeiro de São Francisco. 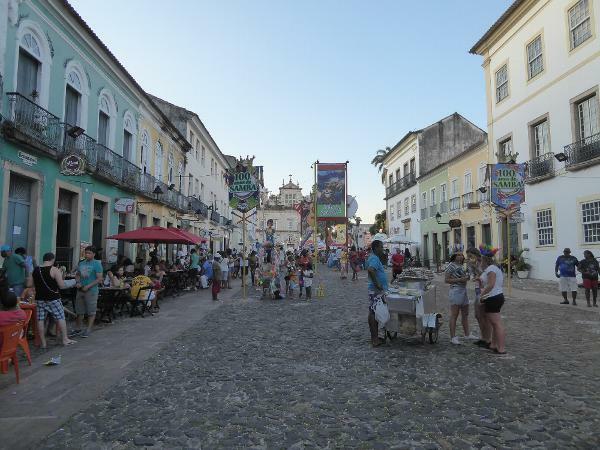 This is about as close as the Portuguese came in Bahia to Spanish-style town planning on the gridiron model. 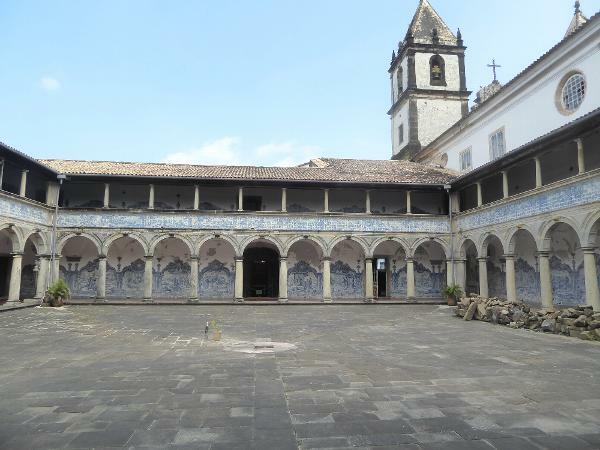 At the other end of the largo and facing the cathedral is this, the church and convent of Saint Francis. 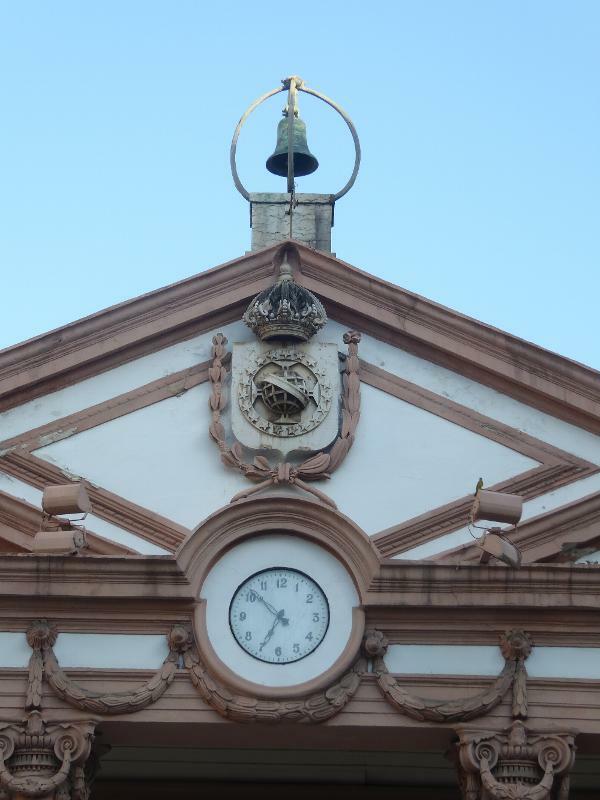 An earlier church was destroyed by the Dutch; the facade of this replacement was finished in 1723, a lifetime after the Jesuit church that faces it. The towers are higher here, and the Greek temple has been ditched. 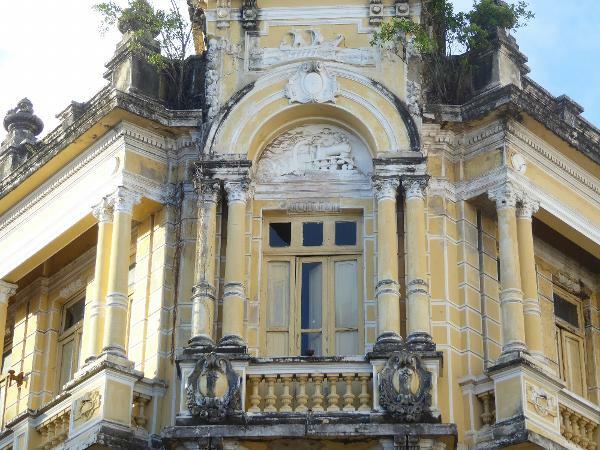 One historian writes of the "sober classicism of that period, with its severity of rectilinear surfaces in the mathematically marked windows, doors, and cornice, and the frequent tendency to design the lower portion of the main façade in the form of a triumphal arch." 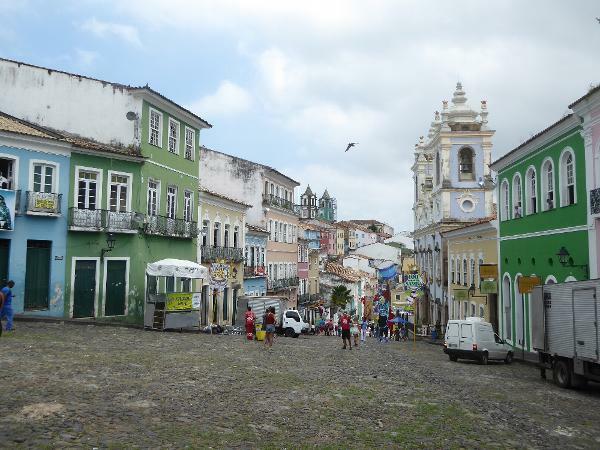 See Robert Chester Smith, "The Colonial Architecture of Minas Gerais in Brazil," The Art Bulletin, 21:2, 1939, p. 132. 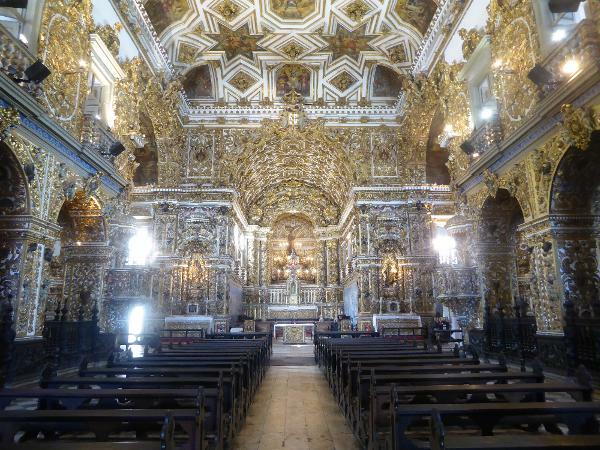 Gilt woodwork (talha dourada) creates a golden church (igreja dourada). An American architect visiting in the 1940s wrote that "all feeling of structure is dissolved by the intricate golden ornament as it ripples indifferently over walls and ceiling." See Philip L. Goodwin, Brazil Builds, 1943 p. 64. Solomonic columns supported by telemons. 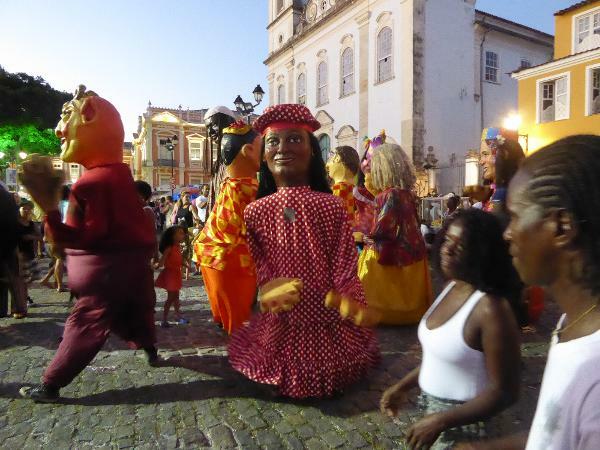 Do those telemons (colossal male figures or atlantes) represent historic figures? 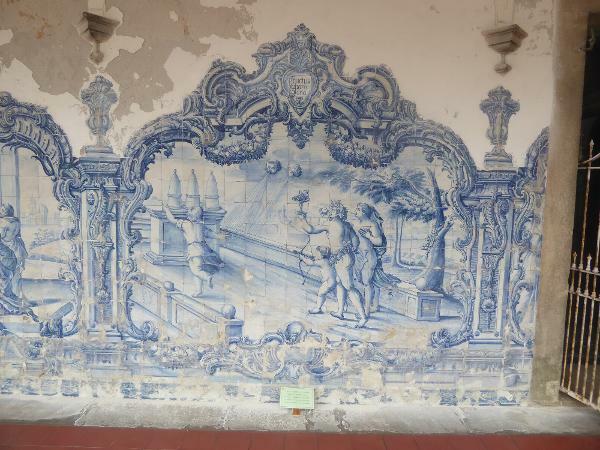 An interior courtyard is walled with Portuguese tiles. What's not tiled is probably painted. Inspiring words courtesy of Horace. Do the bars make you feel safe or imprisoned? Either way, the lane in back of the church is picture perfect. Adjoining the church is another church, this one built by the secular or so-called Third Order of Franciscans. It's not as golden as the church next door but wait. Check the outside of this building. 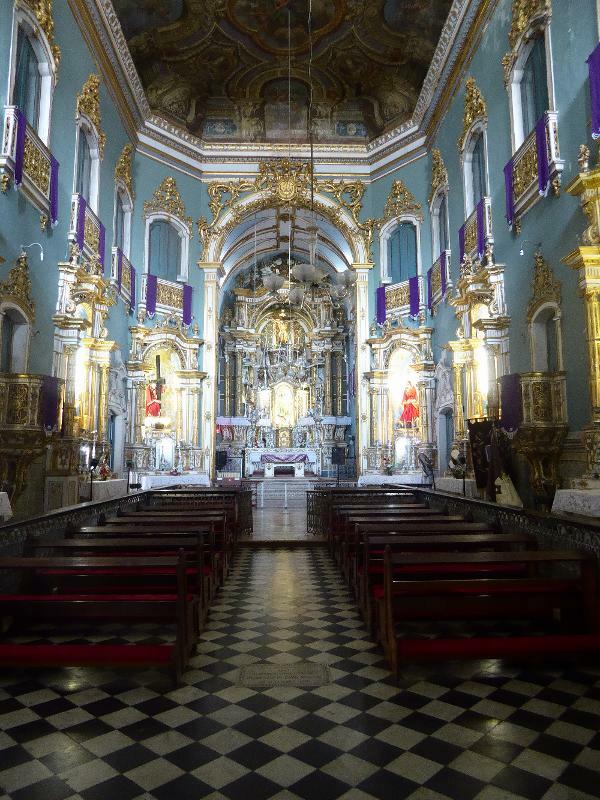 Robert Chester Smith writes that this Church of the Third Order of St. Francis, begun in 1703, is "without doubt the work of some monastic architect of Hispanic origin." He means that the style is perfectly churriqueresque, meaning in the style of the Spanish architect José Benito de Churriguera. 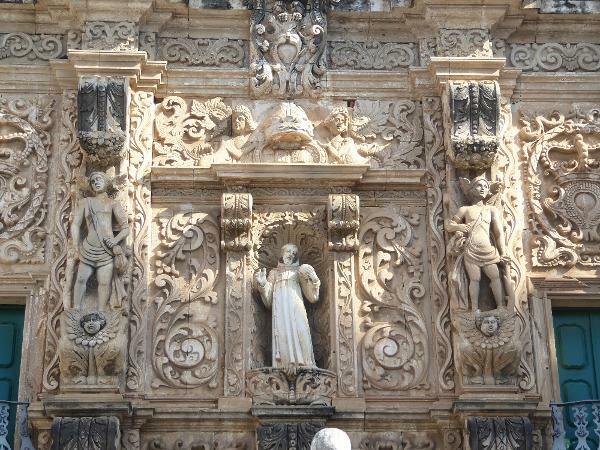 The amazing quirk of this facade is that it was buried in plaster until revealed in the 1930s by electricians. 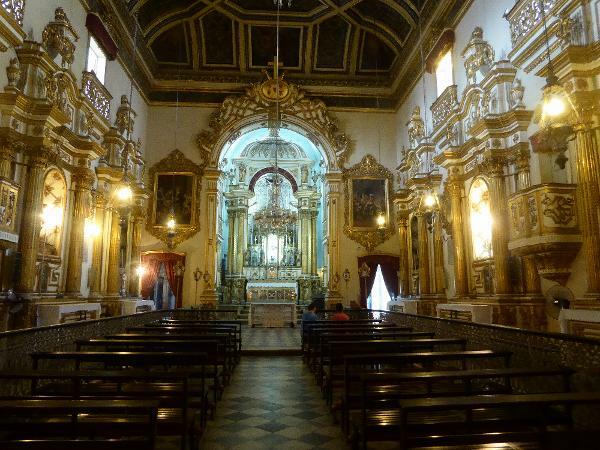 Smith writes that the "statues of St. Francis and other saints of his order are there located in niches of the most extravagant Churriguerresque form, with twisted columns in a veritable forest of exuberant tropical vegetation." We'll push on just a bit beyond pelourinho. 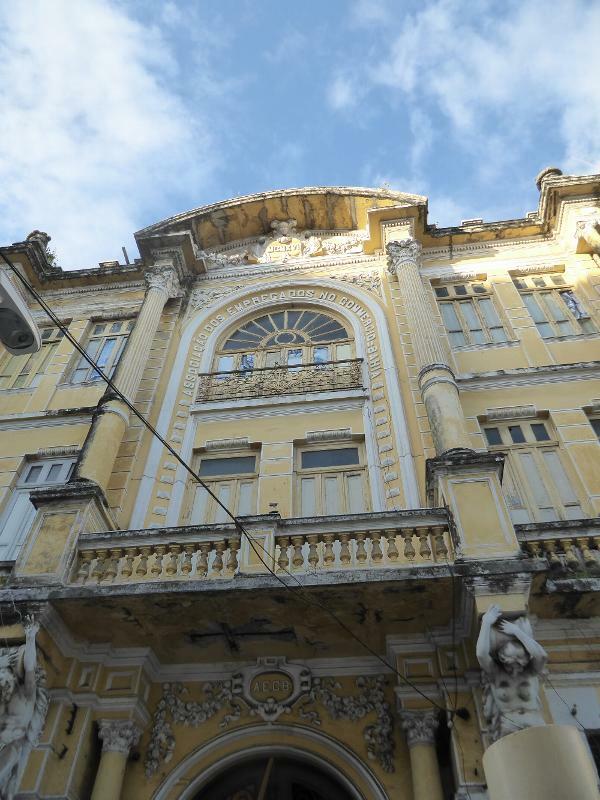 Here's the Rio Branco Palace, rebuilt in 1919 and formerly the headquarters of the state of Bahia. It now houses the state's Cultural Foundation. 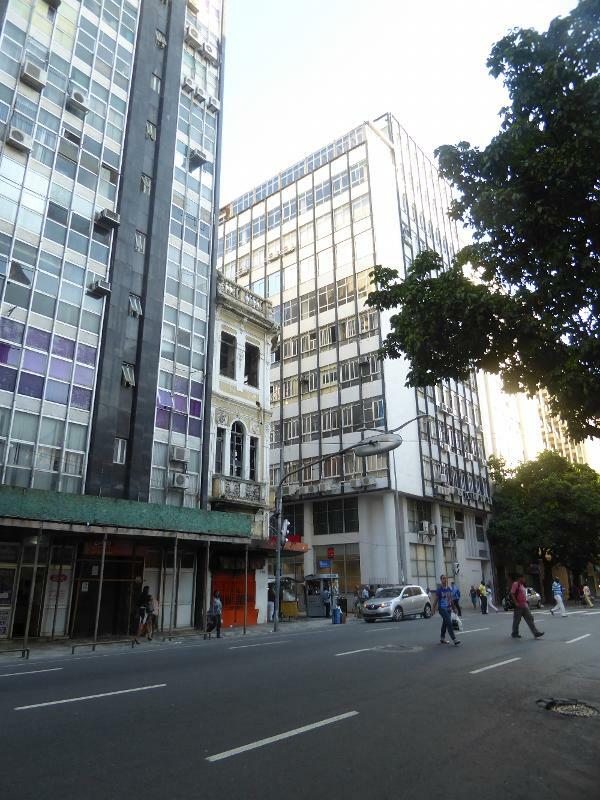 The building is named for José Paranhos, a native of Salvador who rose to become Brazil's prime minister in the 1870s and who was granted the title Viscount of Rio Branco in the later days of imperial Brazil. 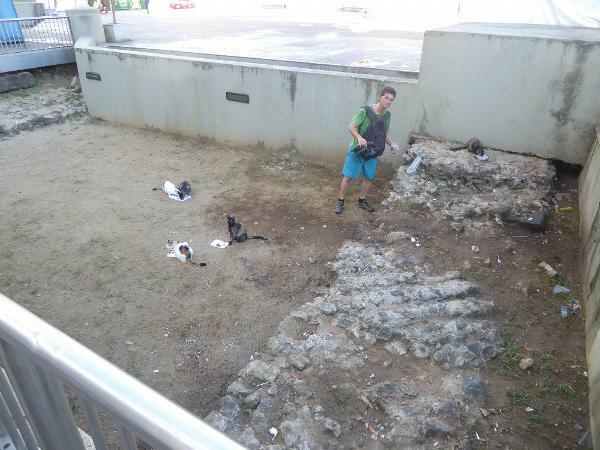 Nearby, someone feeds stray cats near a protected bit of the foundation of the old cathedral. 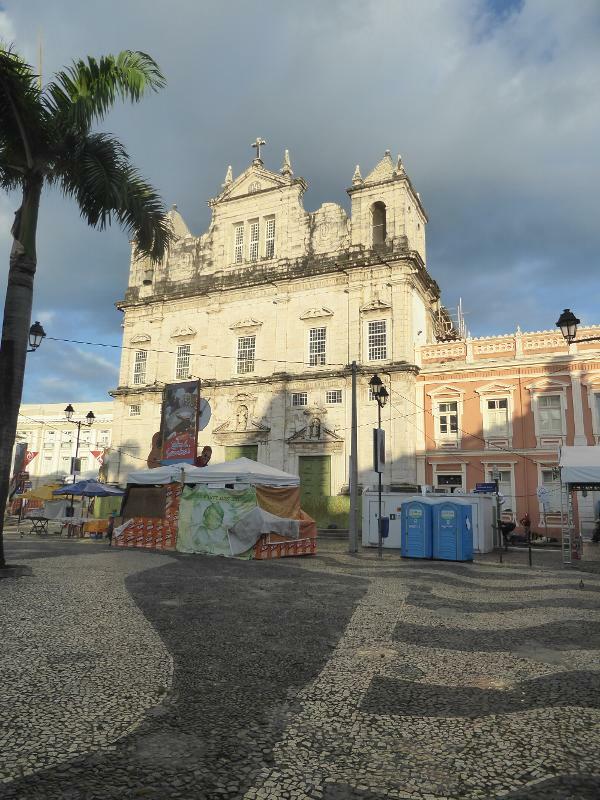 The building was originally a Jesuit church, but it was promoted to cathedral status when the Jesuits were kicked out of Brazil in 1759. 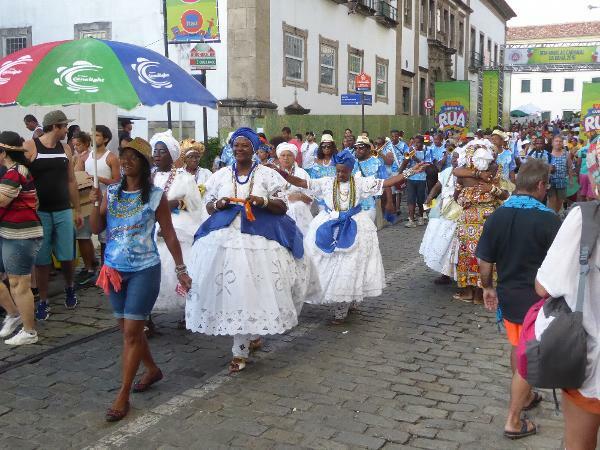 They had shown poor political judgment in condemning the treatment accorded Brazil's Indians. 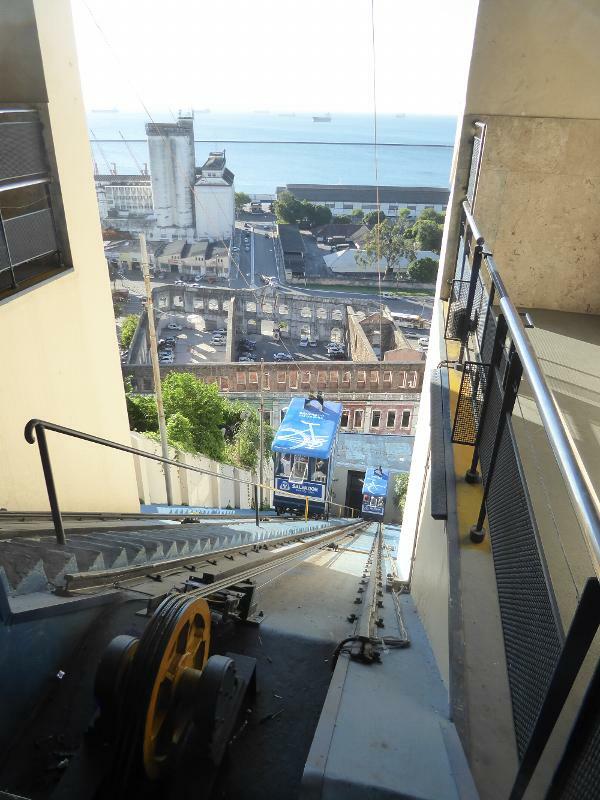 On the other side of the Rio Branco Palace is the famous Lacerda elevator, opened in 1873 to make it easier to move back and forth between the high city (the cidade alto) and the lower city (the cidade baixa). 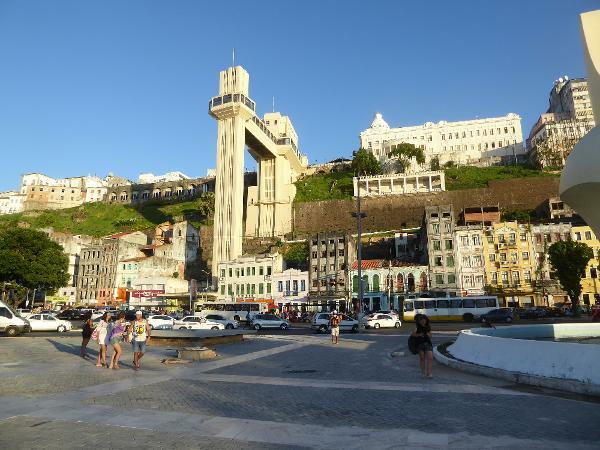 Designed by Antonio Lacerda, the elevator (originally two elevators) was hydraulic at first. 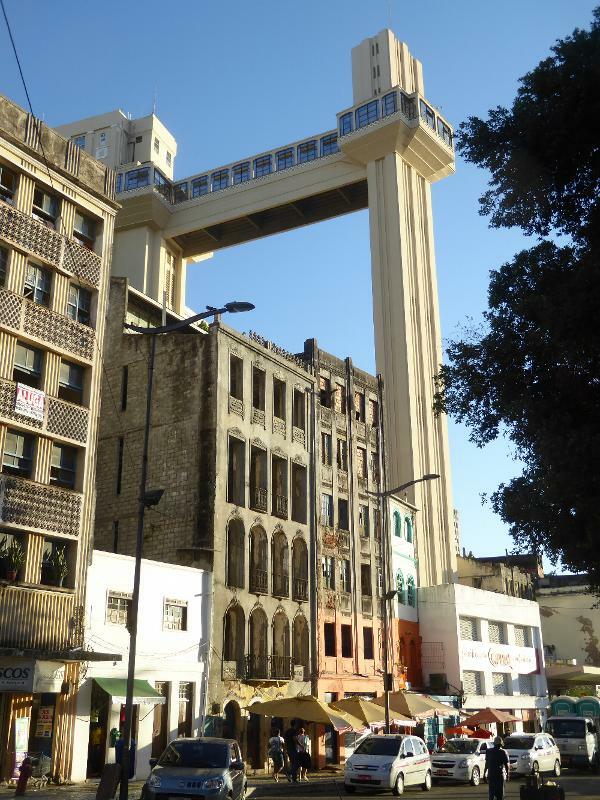 It was electrified in 1906, and in 1930 an additional two elevators were added. 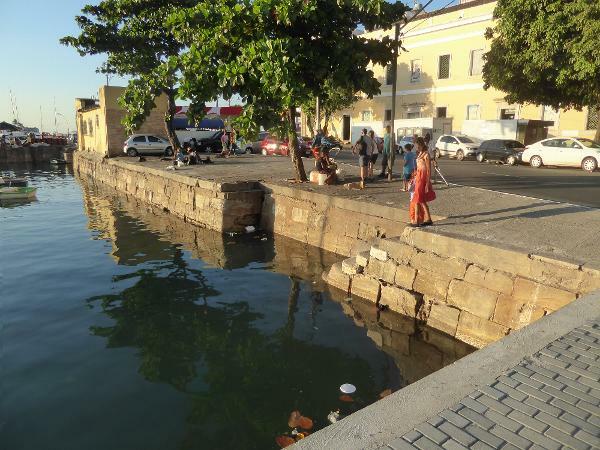 The waterside building is a Brazilian Navy school. Here's the view from down below. 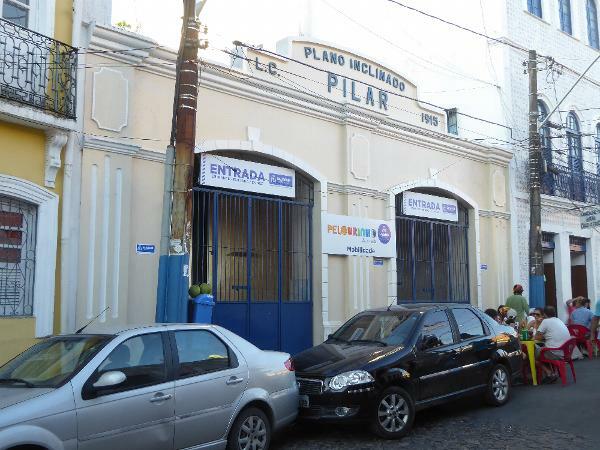 The building on the left is the Mercado Modelo, now a touristy craft market but a general market when opened in 1912. Nearby wharves served fishing boats. The district name needs no translation: it's Comercio. There are several ways down the cliff face. Here's one built in 1897 but later electrified. Why am I thinking "snowboard"? 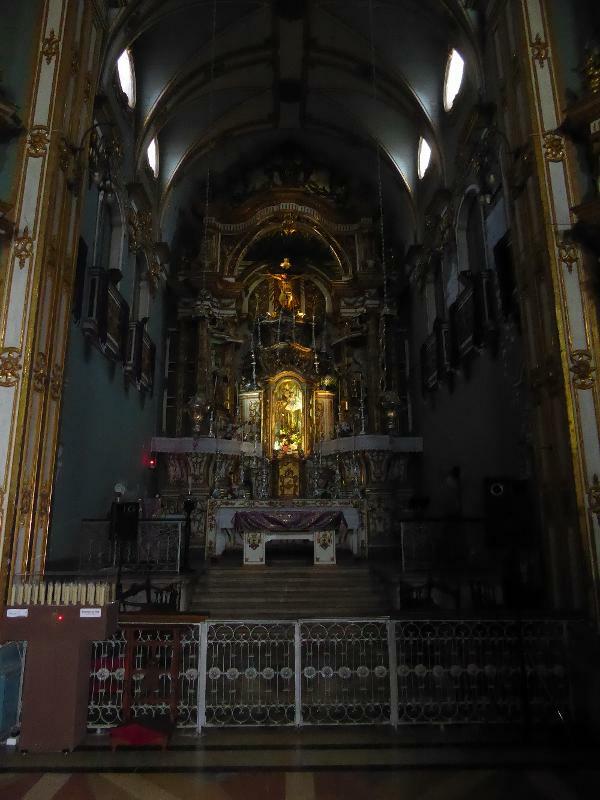 Get off at the bottom, turn right, and you bump into the church of Our Lady of Pilar, completed in 1770 and faced with stone from Portugal. The name (which carries over to the bordering street as well as to the inclined railway) refers to a Spanish tradition that the Virgin appeared atop a pillar before the Apostle James. 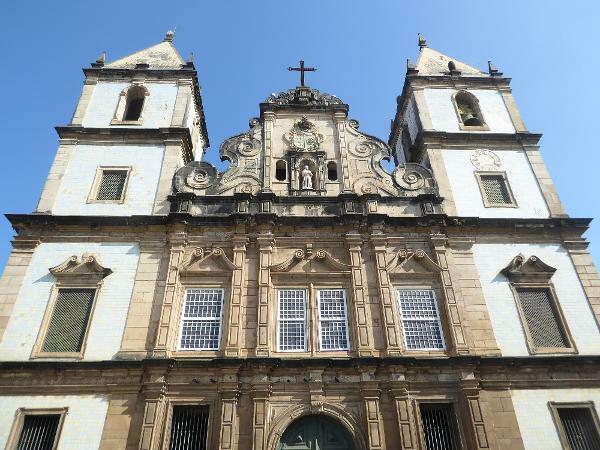 Philip Goodwin, the American architect mentioned earlier, writes that this church has "one of the loveliest exteriors of any church in Brazil." Well, maybe. The church has been closed for so long that he may never have seen the interior. 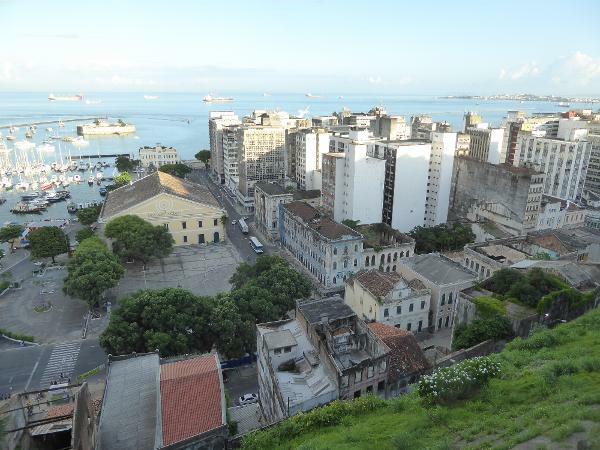 The structure on the right is reportedly a columbarium. The toe of the cliff isn't always tourist-ready. The neighborhood has seen generations of development but has largely been bypassed in the last 30 years as the city has grown northward. 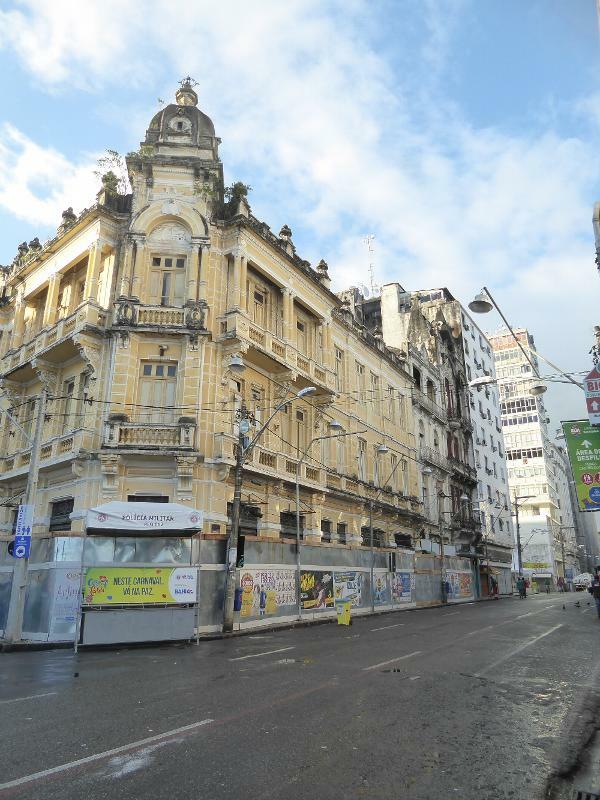 The Sobrado Azulejado or "tiled building" on Rua de Belgica is falling apart. 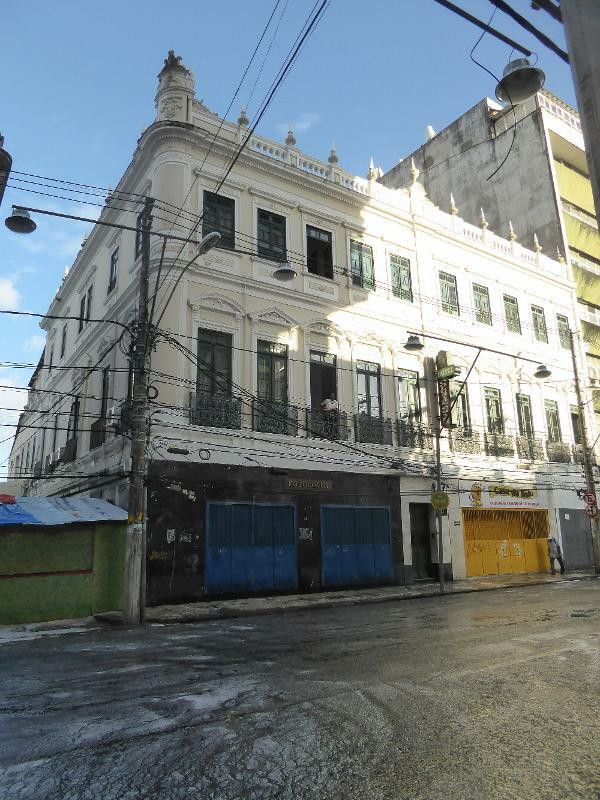 Here, in better shape, is the palace of the ACB, the Associaçao Comercial da Bahia, opened in 1817. 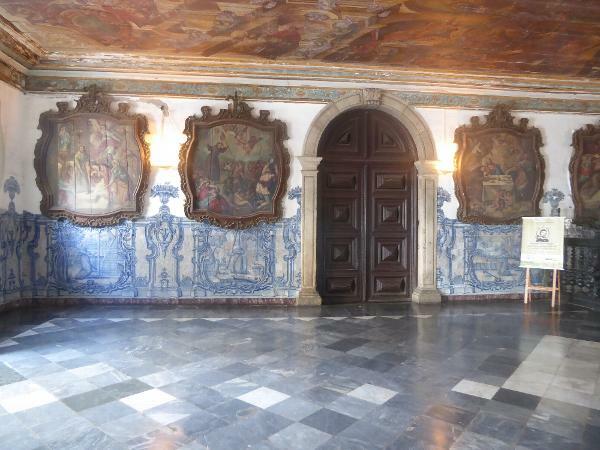 The coat of arms belongs to imperial Brazil and so appears to be at least a slightly later addition. Ditto, on general principles, the clock. 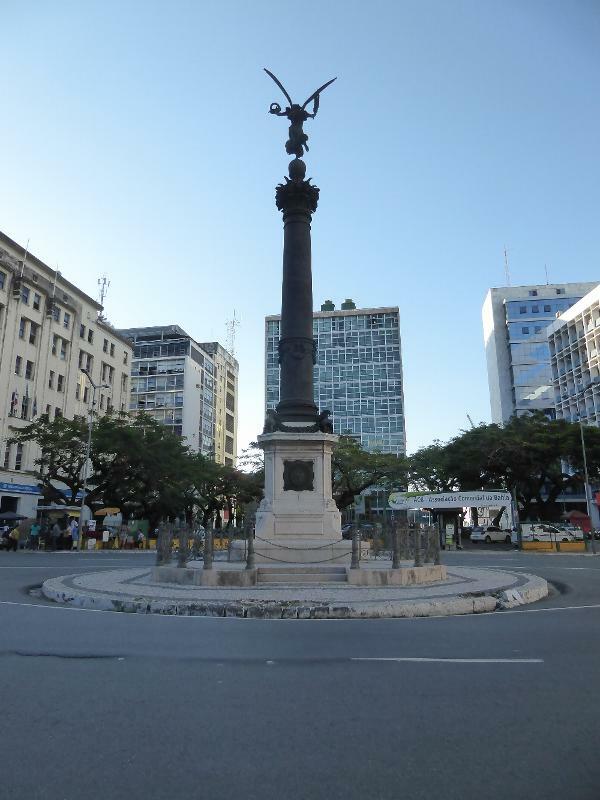 The ACB is there at the left edge and faces a monument that the ACB bought in France and installed here in 1874 to commemorate Brazil's victory at the Battle of Briachuela in the Paraguayan War. You probably wouldn't guess it, but the monument stood on the waterfront until fill was imported to create new land and push the sea out several blocks. 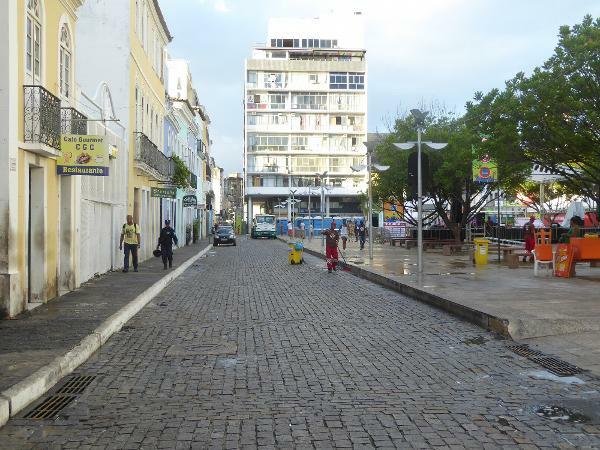 What is now the Count of Arcos Square, in other words, was once water. 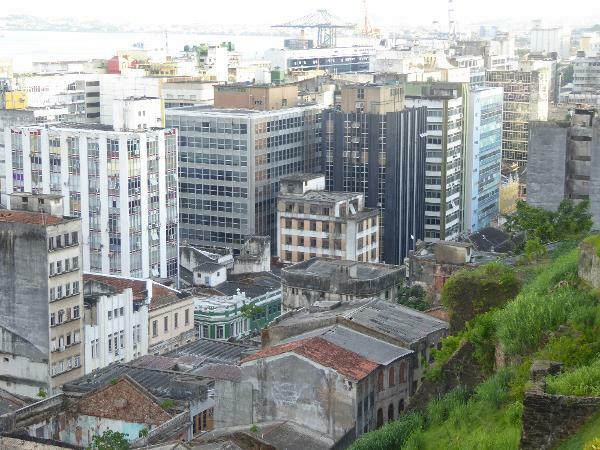 The building behind it is a bank, Bradesco. It, too, stands on fill. 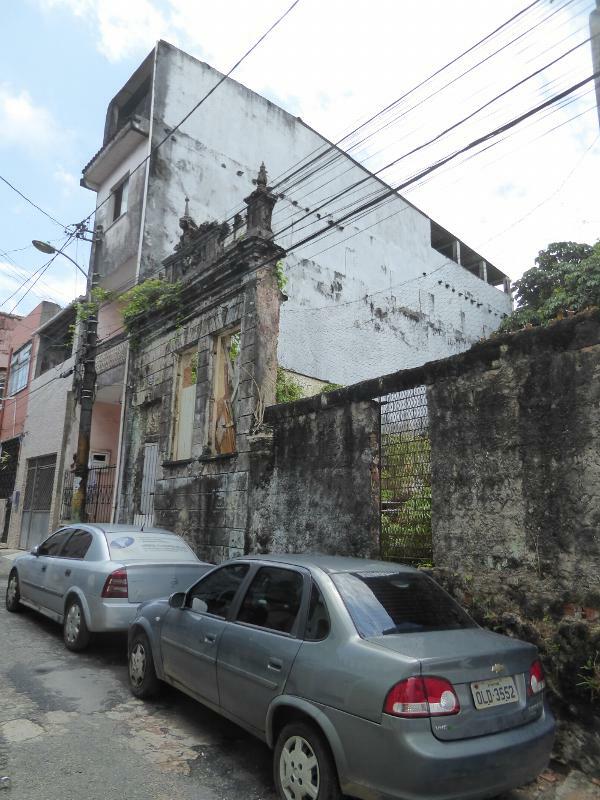 For a photograph documenting the change, see the blog of Eduardo Gantois. 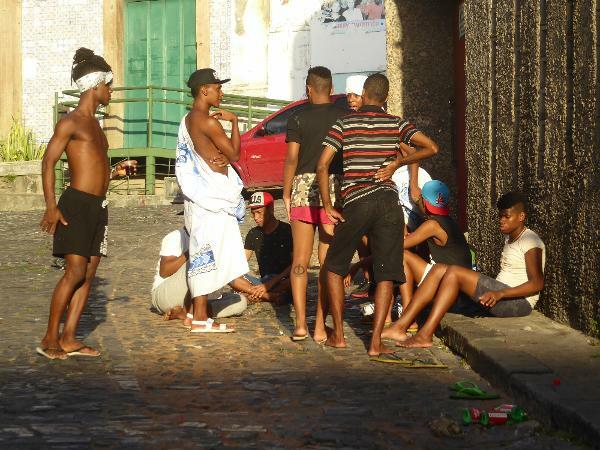 Although business was supposed to stay down in the cidada baixa, it crept up top. 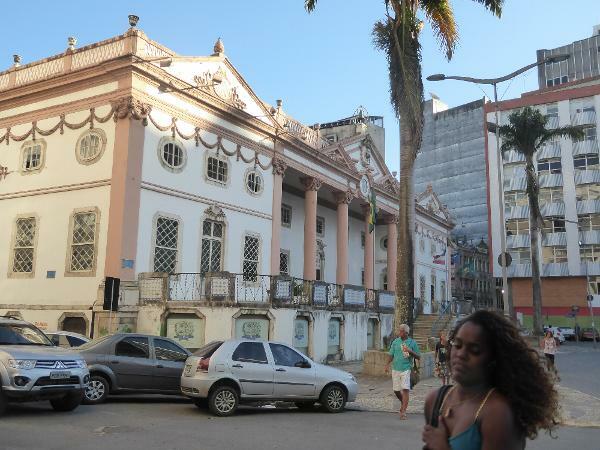 Here, across from the Rio Branco palace, is the Bahia Trade Association, from 1917. 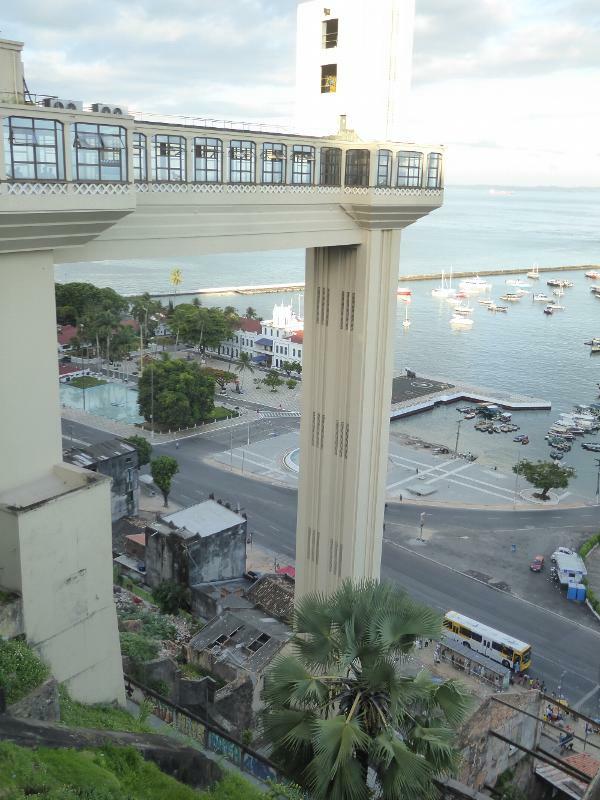 Great ornament, but Bahia in 1916 did not have any rail connection to the distant southern metropolises. In fact it had no rail lines reaching outside the state. Now that's not very gentlemanly: making her carry all that weight. 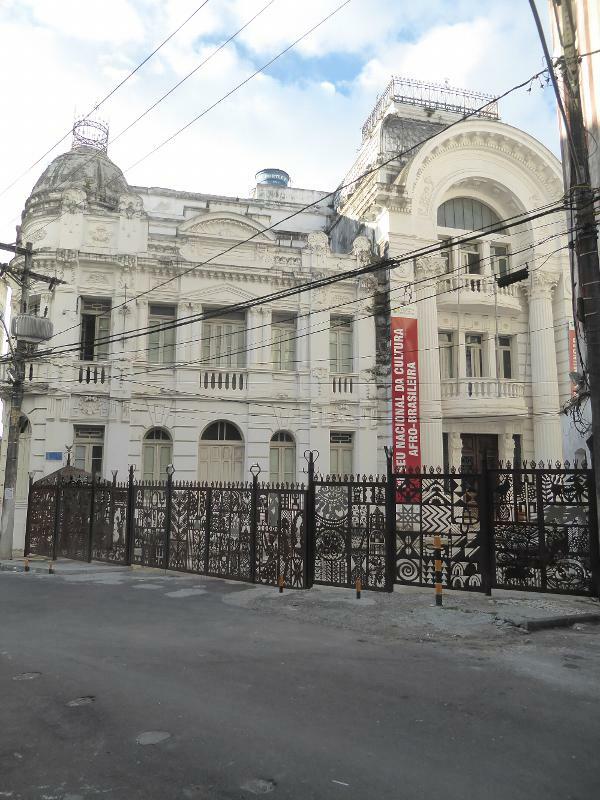 Also close to the Rio Branco Palace, this is the Hotel Colonial Chile, named to honor the Chilean fleet anchored here in 1902. This was the city's best hotel until the 1950s. 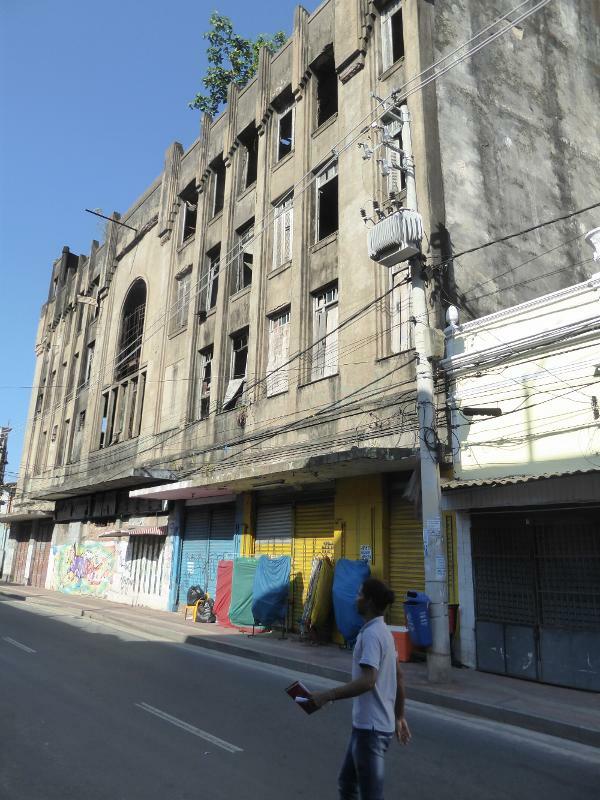 This is the Cinema Jandaia, founded in 1910, rebuilt in 1931 with seating for 2200, and closed in 1993. 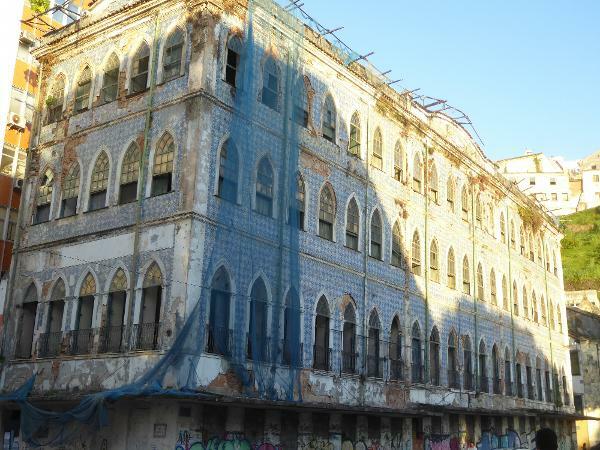 Here's something doing marginally better: it's the Edificio Themis, originally the Hotel Arthemis but now apartments except for a top-floor hotel. The trees mark the axis of the demolished cathedral. The Arthemis must once have been the height of style. Wander farther afield, and there's lots of stuff in ruin. Bricked-up and waiting for another day. Never mind: the show goes on.